The Okavango River is almost dry and the animals on the African savanna are practically dying of thirst! As a Ranger in the nearby wildlife reserve, you have the important task of forming strong herds of animals and leading them to a delta of the fertile river or to one of the sparse waterholes. Each player is an African Ranger. 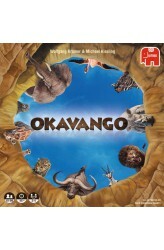 The players are awarded points for leading their herds of animals to the river deltas and waterholes of the Okavango. At a waterhole the player must replace the drinking herd with the same number OR a higher number of animals of a single kind. If the player brings the same number of animals, the thirsty animals must have a higher ranking than the animals already drinking at the waterhole. If the player brings a higher number of animals, the ranking doesn..